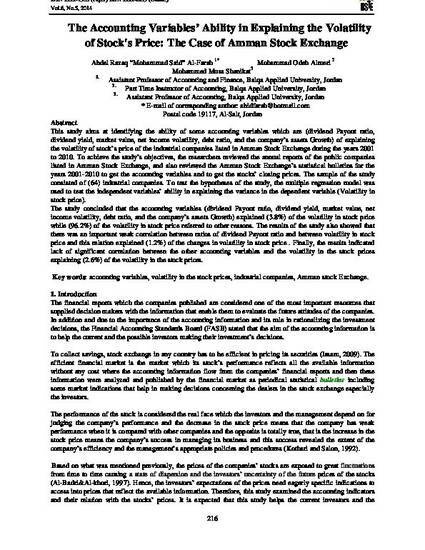 This study aims at identifying the ability of some accounting variables which are (dividend Payout ratio, dividend yield, market value, net income volatility, debt ratio, and the company’s assets Growth) of explaining the volatility of stock’s price of the industrial companies listed in Amman Stock Exchange during the years 2001 to 2010. To achieve the study’s objectives, the researchers reviewed the annual reports of the public companies listed in Amman Stock Exchange, and also reviewed the Amman Stock Exchange’s statistical bulletins for the years 2001-2010 to get the accounting variables and to get the stocks’ closing prices. The sample of the study consisted of (64) industrial companies. To test the hypotheses of the study, the multiple regression model was used to test the independent variables’ ability in explaining the variance in the dependent variable (Volatility in stock price). The study concluded that the accounting variables (dividend Payout ratio, dividend yield, market value, net income volatility, debt ratio, and the company’s assets Growth) explained (3.8%) of the volatility in stock price while (96.2%) of the volatility in stock price referred to other reasons. The results of the study also showed that there was an important weak correlation between ratios of dividend Payout ratio and between volatility in stock price and this relation explained (1.2%) of the changes in volatility in stock price . Finally, the results indicated lack of significant correlation between the other accounting variables and the volatility in the stock prices explaining (2.6%) of the volatility in the stock prices.